What is one to make of a classic extreme metal band who started off with the name Hellhammer, released a couple EPs and then suddenly changed their name to CELTIC FROST? Well, that’s actually not that strange of a thing for a band to do. OK, how about such a band immediately picking up the burning metal torch from Venom and running with it to the point that all of their efforts split off into several 21st metal sub-genres even before such things were orthodox? Now that’s an unexpected feat of influence if i do say so myself as this band pretty much constructed a blueprint for all things thrash, black and doom. However, just as they were about to really take off into becoming extreme metal gods after their influential debut “To Mega Therion” they dived into the unknown, testing their limits and dipping into accessible glam metal territory. This WTF approach tested the patience of even the most eclectic extremists in the crowd and this OMG - WTF are you doing nonsense reached its apex on the 2002 album “Prototype” which lollygagged (me with a [email protected]%N lolly-spOOn) into nu metal and trip hop dancing together but not in a good way :O BTW i like some nu metal and i adore well done trip hop, but these guys were fish out of water in these arenas. MONOTHEIST is a beast of a metal album and while flying the flag of doom metal overall is a triumph of amalgamating various strains of metal (doom, gothic, black, death) with other underlying sounds such as dark ambient, symphonic classical and even progressive rock. This album was a long time coming and cements CELTIC FROST into the world of totally relevant metal acts of all time IMHO. All those visions of unifying different musical genres have been refined into the metal world here and taking the appropriate METAL visions and juxtaposing the so-called distinct “genres” of ideas into a seemingly and hauntingly realism. This album is dark, misanthropic and sombre while remaining heavy, atmospheric and appropriately apocalyptic. CELTIC FROST basically creates a summary of their entire career here without the moldy cheese and ferments their vision into a most fitting grand finale. Although Celtic Frost's earliest albums were incredible blueprints for the more "evil" brands of extreme metal (death metal and black metal) to follow, their later efforts weren't so influential. Into the Pandemonium, whilst intriguingly experimental, didn't really inspire anyone to follow suit, whilst Cold Lake and Vanity/Nemesis found the band following the glam metal and thrash metal pack respectively. Monotheist, their reunion album, is another question entirely. After decades of other bands building on the mighty foundations erected on such recordings as Morbid Tales, Emperor's Return, and To Mega Therion, Celtic Frost's return finds them synthesising more or less every extreme metal genre imaginable into a horrifying chimera. The centre of gravity of the album's sound seems to be rooted in doom metal - but of a distinctly modern bent with little Black Sabbath influence - but so much of death metal, black metal, gothic metal and even progressive metal (particularly on the closing triptych) seems into the music that it's incredibly hard to pin the album down. What's even more impressive is how well this delirious mishmash of genres works. It's clear that Celtic Frost haven't settled for any mere nostalgia-fest from the reunion; instead, they've produced an album which sounds incredibly ahead of this time, showing the young imitators once and for all who the real kings of extreme metal are. We may never know the exact reasons behind the final Celtic Frost split - Tom Warrior isn't letting any hints slip beyond his disappointment at Michael Ain for suggesting that the band might continue without Warrior, and his barely-concealed rage at drummer Franco Sesa who Warrior seems to primarily blame for the split - but we can at least be grateful they went out with a bang. In fact, I'd say this is the greatest album they ever made. This is an album that my brother told me was a "masterpiece"...ok I agree with him. This album really came from nowhere, and when Celtic Frost reunited, no one imagined that an album would be made, and this really did shock the metal community a great bunch. Celtic Frost in the 80's & 90's proved to push metal either in the right direction (e.g. Hellhammer days, To Mega Therion, Into The Pandemonium)...and the not so great (Cold Lake). But this...a great amount of time later, really did cement these guys as the rightful heir to the thrones of metal!!! This album is very different to what we could ever expect. With obvious more extreme influences, this album took metal and really made it interesting. This album really was well recieved too, and to be honest, it deserves every accolayde and achievement it gains! Very dark, very doomy, and very disturbing throughout, this album really does proove that metal can progress with every century. Their is also a very experimental, noisy and droney nature to the album at times, and most sub genres of metal are found in this album, making one of the greatest obelisks of metal, in my opinion. Sadly these guys broke up and the partnership between Thomas Gabriel Fischer & Martin Eric Ain is no more, but their is hope and solemnity in Triptykon, which to be honest, I believe picks up the pieces. CONCLUSION: This really is going to influence extreme music for many many years to come. The Journey of Celtic Frost has been a long and rugged one, going through very different lands. The band started out, back in the Hellhammer days and also at the "Morbid Tales"/"Emperor's Return" era, playing a sort of primitive and sloppy thrash metal which was very much one of the earliest incarnations of black metal. Then, on "To Mega Therion" and "Into the Pandemonium", they developed a dark and dirty type of avant-garde metal, making use of elements from all over the musical palette before going in a more traditionalist heavy/glam metal direction on the much despised "Cold Lake" before entering into thrash metal territory with the midpaced still thrashy "Vanity/Nemesis". And now they have reached the end of their journey (they are not likely to release an album again unless Tom G. returns to the band) on a very dark and depressive note, as they venture into the territory of doom and gothic metal, producing perhaps the ugliest [in a positive sense] swansong ever. The music on "Monotheist" is unmistakably Celtic Frost: the dirty guitar sound is instantly recognized and the sense of darkness that has "haunted" the band since their first releases is still there. Most of the tracks are dark and heavy and doom-ladden, and many, such as the "Triptych" suite, also include amusical dark soundscapes. Some of the more upbeat tracks (if "upbeat" is even applicable here) like "Progeny", are slightly groovy, making use of riffage that reminds me of Sepultura's "Roots Bloody Roots". While not as slow as a lot of modern doom metal, "Monotheist" is just as bleak and hope-crushing, and I've even read a review somewhere describing it as scary, which is actually a quite good description. I mean just check out "A Dying God Coming into Human Flesh" and the "Triptych" tracks, for instance, and hear how dark and gloomy they are. While not funeral doom or sludge doom, "Monotheist" displays the same sort of bleakness, and I think it will appeal to fans of doom metal along with long time Celtic Frost fans. 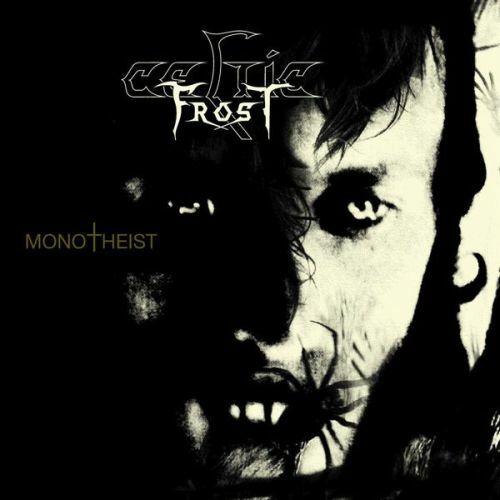 "Monotheist" is the 5th full-length studio album by Swiss extreme metal act Celtic Frost. The album was released through Century Media Records in May 2006. Celtic Frost disbanded in 1993 and it was not until 2001 when they reformed again, so "Monotheist" is their first album release since "Vanity/Nemesis (1990)". "Monotheist" marks quite a comeback for Celtic Frost. First off the sound production is is of a very high quality. A largely self-produced affair, the sound on "Monotheist" is raw, yet very well balanced, detailed, and clear. Secondly the material on the album is generally of a high quality too. It´s a rather diverse album and touches blackened thrash metal, doom metal, goth metal, and even features some industrial metal elements. Tracks like "Drown in Ashes" and "Domain of Decay" represent the atmospheric and goth oriented side of the band´s sound while material like the opening trio of tracks "Progeny", "Ground" and "A Dying God Coming Into Human Flesh", "Ain Elohim", and a track like "Triptych: Synagoga Satanae" bring a darker and more raw side of the band´s sound to the table. Those tracks feature powerful and heavy riffs and a really dark atmosphere. The vocals on the album are mostly raw and aggressive, but there are clean singing on the album too (including female vocals). 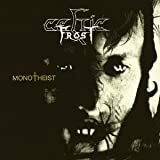 "Monotheist" is overall a high quality release by Celtic Frost and definitely a welcome comeback to the band. The diversity of the material is both a blessing and a curse depending on the listener, as you can´t always expect those who prefer the band´s extreme metal side to also enjoy their gothic atmospheric side, but to those with an open mind, "Monotheist" is definitely a recommended listen. Considering the eclectic nature of their discography I´m sure most listeners won´t be surprised by the diversity of the material though. A 4 star (80%) rating is deserved. Monotheist marks the return of highly influential Swiss veterans Celtic Frost after a 14 year absence. The music is dark, heavy and aggressive, with touches from Goth as well as from industrial metal. The tempo is way slower than what it was last time they were around, and the music in general is more experimental as well. The experiments here are more subtle than what they were in the past though; it takes time before the finer details buried in the soundscapes are drawn to your attention. A worthy comeback from one of the most influential bands in the extreme metal scene. 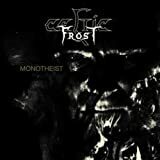 No CELTIC FROST MONOTHEIST reviews posted by members yet.